Africa: CIA Blocks Trump's Africa Policy Pick – What Now? Where Next After CIA Blocks Trump’s Africa Policy Pick? Will Trump's Policies Send African Professionals Home? Could Trump's Deportation Policy Be a Blessing to Continent? 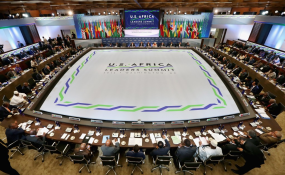 The U.S.-Africa Leaders Summit in August 2014 saw the largest gathering in Washington, DC of presidents and other top officials representing most of the continent's governments. Washington, DC — Africa policy in the Trump White House has become more difficult to predict following reports that the senior director for Africa on the National Security Council is out. Citing two sources "with direct knowledge", Politico reported Friday that Robin Townley was notified "the Central Intelligence Agency has rejected his request for an elite security clearance required for service on the NSC." Townley is a former Marine intelligence officer "who had long maintained a top secret-level security clearance," according to Politico. He was one of the early staff choices by national security adviser Mike Flynn, whose selection in December has become even more controversial amid revelations of his conversations with the Russian ambassador to the United States before Donald Trump took office, raising concerns that Flynn had broken a law against American civilians engaging in diplomacy. While conducting foreign policy is the job of the State Department, the NSC plays a pivotal role in both shaping and coordinating policy in line with the priorities of the president. The apparent turnover in the senior White House Africa post is expected to further delay development of a coherent policy towards a large, diverse and strategic region. The possibility of abrupt shifts in U.S. Africa policy was raised by a New York Times story last month reporting on a "four-page list of Africa-related questions" from the Trump transition team that reporter Helene Cooper said "indicate an overall skepticism about the value of foreign aid, and even about American security interests, on the world's second-largest continent." Among the questions raised, according to the article: "With so much corruption in Africa, how much of our funding is stolen? Why should we spend these funds on Africa when we are suffering here in the U.S.?" According to State Department officials who spoke to AllAfrica anonymously because they were not authorized to provide on-the-record comments, there was almost no contact with the Trump team prior to the January 21 inauguration. Department officials drafted questions internally to help prepare their staff for queries expected to arise from the White House. Progress towards a coordinated policy direction for Africa – and for other regions and issues - is hampered by the slow pace of appointments to senior and mid-level State Department posts. Secretary of State Rex Tillerson's choice for his senior deputy secretary, Elliott Abrams, was rejected this week, according to the Washington Post and other media outlets, after the President became aware of critical comments about Trump that Abrams made during the election campaign. Many other senior posts in the department are currently vacant, and career officers are operating as stand-ins without clear policy direction. One person thought to be on Tillerson's list for a high-level State Department post is Walter Kansteiner, currently senior director for Africa at ExxonMobil, the company Tillerson headed before his nomination as Secretary of State in December. Kansteiner was Africa director at the NSC in the early 1990s under President George H.W. Bush and served as the first Assistant Secretary for Africa for President George W. Bush from 2001 until 2003. Kansteiner could be tapped to be Undersecretary for Political Affairs, the number four position (after the Secretary and two deputies), according to a speculative report earlier this month by the London-based newsletter Africa Confidential. If so, he would bring high-level government experience and expertise that the secretary himself lacks. But there are indications he has turned down a job offer, opting to remain with ExxonMobil based in London. "Tillerson may become the key American player on Africa," says Ambassador Johnnie Carson, who served as Assistant Secretary of State for Africa in the first Obama term. In an article published earlier this month, Carson says Tillerson could put Africa policy on "solid footing" if he chooses an experienced Assistant Secretary and decides to continue "key Bush- and Obama-era food, health and power development initiatives", as well as retaining Obama's support for U.S. Africa business ties. In the Africa Bureau at State, officials report that routine business continues but no new initiatives can be undertaken until policy directions are adopted by top administration decision makers. Linda Thomas-Greenfield - a career senior foreign service officer selected for the post in 2014 by then-Secretary John Kerry, succeeded Carson. She has been asked to remain in the post until her successor is named, Department sources say. A leading choice to replace her is widely thought to be Dr. J. Peter Pham, Vice President for Research and Regional Initiatives and Director of the Africa Center at the Atlantic Council, a Washington, DC think tank. He is a prolific author of analytical essays and books whose work has focused on African security issues. Africa policy experts outside government see Pham as a well-informed specialist who would listen to diverse views about complex situations. Other names that have surfaced in published reports and private discussions include Kate Almquist Knopf, director of the Africa Center for Strategic Studies at National Defense University; Jeffrey Krilla, vice president for government affairs at Kosmos Energy, who served as deputy secretary in the State Department's human rights bureau under President George W. Bush; Todd Moss, who also served in the Bush State Department and is currently senior fellow at the Center for Global Development; and Charles Snyder, career intelligence officer who has held senior military and State Department Africa-related posts. The NSC's Africa director has a central role in policy formulation. "The senior director is responsible for staffing the president and NSC leadership and for coordinating the many different U.S. departments and agencies to ensure a clear and unified strategy advancing the president's agenda," according to Grant Harris, who held the post for four years under President Obama. "A prolonged vacancy in the senior director role can stall decision making and cause confusion as to policy direction," Harris told AllAfrica. The person responsible for Africa at NSC "needs to know the region well - politically and economically, while also being mindful of the importance mutual understanding and respect are in building key relationships," according to Ambassador Robin Renee Sanders. She was Africa director on the NSC staff during the presidency of George W. Bush before serving as U.S. ambassador to the Congo Republic and Nigeria. Sanders says there are many Republicans who have Africa expertise about Africa. "All of us who work on Africa would like to see one of them in this critical position," she told AllAfrica. Most senior posts important for U.S.-Africa relations remain unfilled. These include the top post at the Agency for International Development (USAID). The leading candidate is thought to be Mark Green, the current president of the International Republican Institute. Green, who served four terms representing Wisconsin in the U.S. House of Representatives, was U.S. ambassador to Tanzania from mid-2007 to early 2009 during the administration of George W. Bush. Another possible pick is Martin J. Silverstein, a former ambassador to Uruguay under President George W. Bush, currently senior counsel at the DC law firm Greenberg Traurig. According to Devex, Silverstein 'has close links to top Trump aide" and son-in-law Jared Kushner and advocated in a court case on Kushner's father's behalf. During his Senate confirmation hearings, Tillerson made positive comments about the foreign aid agency Millennium Challenge Corporation and about PEPFAR, the President's Emergency Plan for AIDS Relief launched by George W. Bush and continued by President Obama to fund treatment for HIV/AIDS, malaria and other deadly infections. No appointments to head those agencies have been announced. Other key posts being monitored by Africa watchers include the USAID Assistant Administrator for Africa, the Assistant U.S. Trade Representative for Africa, African-related positions in the Commerce, Treasury, Energy and Justice departments and U.S. Executive Directors to the World Bank and African Development Bank. Africa experts say having an effective director for the African Development Bank, a position that has remained unfilled for over three years, is important for advancing American interests, as well as for supporting African economic development. President Obama's 2014 nominee Marcia Occomy remained unconfirmed, caught up in the Senate's go-slow on Obama's appointments, although she had widespread bipartisan support. Most appointments to ambassadorial posts in Africa have traditionally been allocated to career diplomats. A major exception since the non-racial election in 1994 won by Nelson Mandela has been South Africa. Kenya and Tanzania have also had political appointees. According to a speculative report published by Daily Maverick, a Johannesburg-based online news site, Trump's choice for the South African post could be Joel Pollak, a South African-born lawyer who is senior editor-at-large of Breitbart, the right-wing platform for white-supremacists that was headed by White House chief strategist Steve Bannon. Pollak would be a very different ambassador than "his suave predecessor Patrick Gaspard", the Maverick's Rebecca Davis writes: he has called South Africa's ruling ANC 'dangerous' and labelled the country's affirmation action policies 'disastrous' and the government's foreign policy 'bizarre'. Although South African activists, protesting students and fierce social-justice advocates like Anglican Archbishop Thabo Makgoba of Cape Town – a post once held by Nobel Laureate Desmond Tutu - are mobilizing against the corruption of President Jacob Zuma's government, the views of Pollak are not the kind of change they have in mind. It will be interesting to watch public reaction to whatever Donald Trump does.